I’m asked, almost on a weekly basis, “How do you have so much time to work out?”. I visit the gym 5-6 days a week and so does my husband. With exercise classes two nights a week, things can get crazy and sometimes dinner gets pushed to 8pm. But, we make it work! We have a routine down and sometimes that means he has to make dinner for the family. My husband doesn’t mind making dinner, but it needs to be something easy, without a lot of ingredients and instructions. One of his favorites? Hamburger Helper of course! This is so easy, anyone could make it. 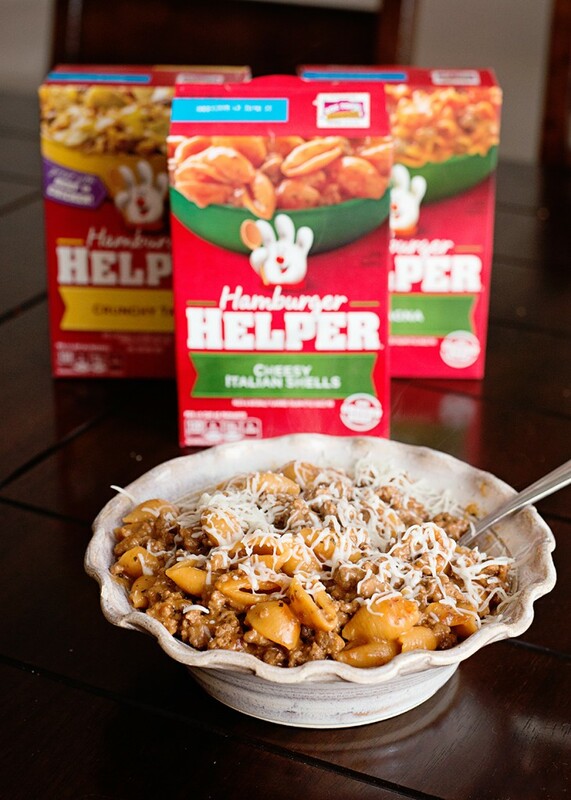 Not only is Hamburger Helper easy as pie to make, it’s so affordable too! I love to put a meal or two on our weekly menu that is really low in cost, anything to keep our grocery bill down. This week, Hamburger was on sale for $1 at our grocery store. Topped with this awesome rebate for a FREE package of ground beef, we just fed the entire family for about $1. Not too shabby! 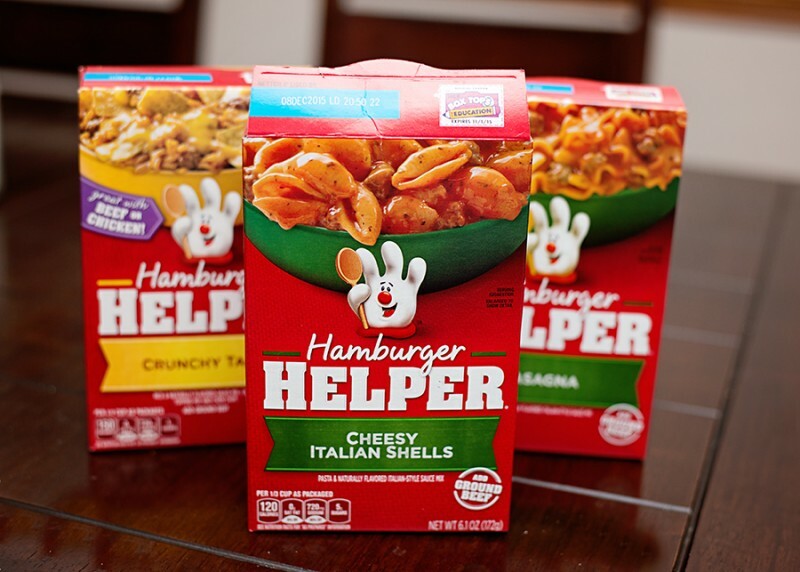 There are so many varieties of Hamburger Helper these days, even Chicken Helper! I picked up a few of our favorites during the $1 sale to take care of dinner during our busy week nights. One of our biggest goals right now is to cut down on the eating out. When sales come around like this, in addition to the free ground beef rebate, it’s a no brainer when it comes to picking up extra boxes! There are always unexpected nights when you just don’t have the time to prepare a 10 ingredient meal. 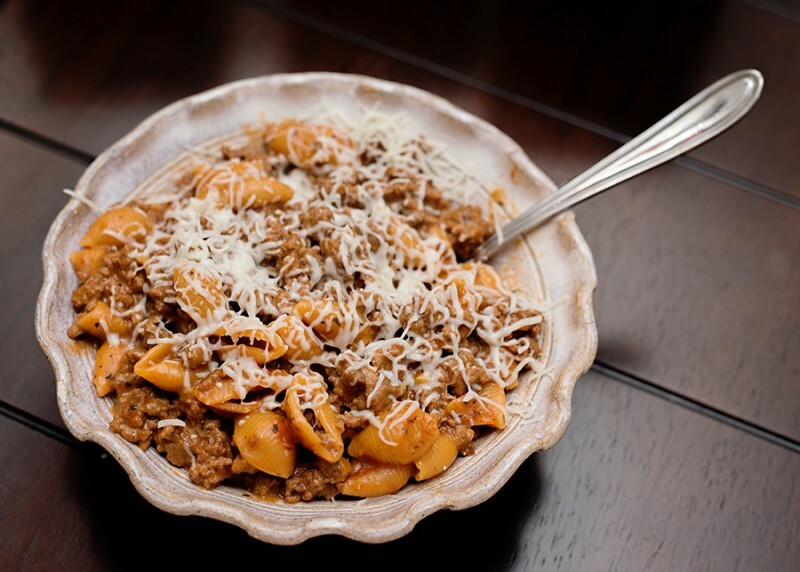 Grab a box of Hamburger Helper and in less than 30 minutes you will have a meal on the table. Cheesy Italian Shells is what we had for dinner tonight. I love this variety because you can mix it up with other things, throw some onions in there, top it with a little mozzarella cheese or you could even throw in some diced tomatoes! We all have those super busy nights when we don’t want to think about dinner. 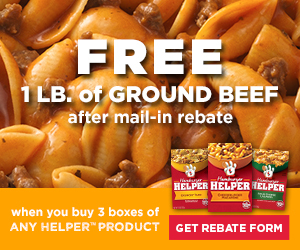 Grab the FREE ground beef rebate below, along with some other great coupons, and make your next meal super easy!